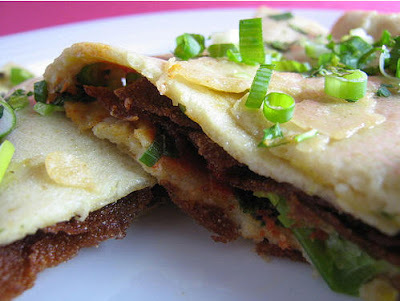 One of the most common examples of Chinese street food is "Jianbing". There is not actural traslation of it in English since it's totally Chinese traditional food. We could just call it Chinese Pancake as an alternative. Jianbing is made on the spot. It consists of a thin crepe placed on a hot surface. An egg is cracked over it and quickly swirled around. As the egg cooks, cilantro and spring onions will be scattered around it. At this point the jianbing maker might ask you if you would like a bit of spicy sauce on it. The spicy sauce isn’t that spicy but provides a nice tang. The last ingredient is a large fried dough crisp, of a similar consistency to the wonton strips that would come with a Chinese take-away back in the States. The crisp is placed in the middle of the eggy, oniony crepe. Finally, the crepe is folded over the whole thing. At the going rate of 2.5 - 3 RMB for one, jianbing makes for a great and quick breakfast. True, there is nothing healthy about it, but it smells so good in the morning that I usually can’t resist a quick one with a cup of warm soy milk. The best Jianbing, in my opinion , has two things at make it truly great. One is that the fried crisp in the middle is freshly fried and extremely crunchy. Frankly, a soggy crisp in the midst of the jianbing makes for a somewhat disappointing experience, and once you’ve had the crunchy ones you can never go back to the second-rate soggy ones. Secondly, a good jianbing includes cilantro in the mix. Many jianbing vendors don’t include cilantro, but I find that it packs an added punch with each bite.